After an early teaser last week, Premium Bandai has announced the full release details for the Tamashii Lab recreation of the signature weapon from Kamen Rider Black RX– the RevolCane! This screen-accurate prop is being produced in honor of Black RX’s 3oth anniversary. 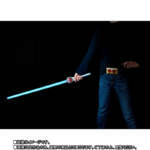 A copy of Black RX’s belt is included to replicate the on-screen summoning sequence. 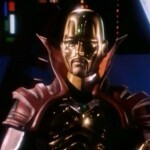 The RevolCane will also feature new dialogue recorded by Black RX’s actor, Tetsuo Kurata. Finally, a special display stand will be included to show off this amazing prop! The Tamashii Lab RevolCane is currently scheduled for release in October 2018! The price is a modest 19440 Yen before shipping and handling! 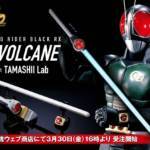 Tamashii Lab Reveals Kamen Rider Black RX RevolCane! This year marks the 30th anniversary of fan-favorite Kamen Rider series Kamen Rider Black RX! In celebration of this milestone, Tamashii Lab has revealed a brand-new item: a properly-scaled release of Black RX’s signature weapon, the RevolCane! Sadly, price and release details are not confirmed at time of writing. Full reveal of the Tamashii Lab RevolCane is apparently scheduled for March 30 2018. Stay tuned to TokuNation for further details! Kamen RIder Black RX and the 00 Quanta are also in the game, interestingly enough those two will be treated as form changes according to the trailer. Lost Heroes 2 will be released on the Nintendo 3DS console in February 15th 2015, a premium version is also available for purchase. 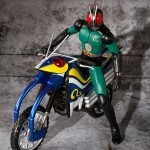 Kamen Rider 3’s TriCyclone Revealed! 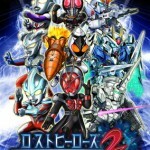 The upcoming Super Hero Taisen GP: Kamen Rider 3 will of course feature the first ever on screen appearance of the one-off Kamen Rider 3. A unique rider who only appeared once in a short 1972 story. 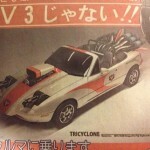 However this film will also mark the first appearance of his vehicle, the TriCyclone! The TriCyclone certainly appears to be an impressive machine worthy of going up against Kamen Rider Drive’s Tridoron and Black RXs Rideron, both of which will be in this film as well! 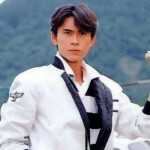 Will Kamen Rider 3 ally himself with his car driving brothers or will he stand in line with the bike riders of old? Discuss this reveal as well as the rest of our coverage of Super Hero Tasien GP in our ongoing discussion thread! 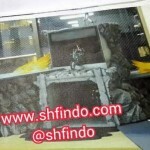 The Indonesian fan-site SHFindo.com has spotted a couple interesting prototypes during the setup for a Tamashii Nations show taking place this weekend. New Figuarts based on the alternate forms of Kamen Rider Black RX are on display- RoboRider and BioRider; also known as “Masked Rider Super Gold & Super Blue” for the few American fans! 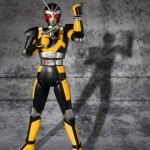 The new Black RX Figuarts are also shown with their motorcycles, the Roboizer and the Mach Jabber. Prices and release details are to be confirmed, so stay tuned to TokuNation as we keep you up to date on these thrilling reveals! Alien Mephilas – Ultraman Episode 33 & Reprising the role in Ultraman Mebius. The entire staff of Tokunation as well as TFW2005 are deeply saddened to hear of his passing and would like to wish his friends and family nothing but the best. Bluefin Distributing has picked up the S. H. Figuarts Renewal versions of Kamen Rider Black RX and his motorcycle, the Acrobatter. RX will retail for a mere 34.99 USD while Acrobatter will cost 43.99 USD. Both are set for release in May 2014! Definitely a good set for all the fans who were probably introduced to Kamen Rider with these designs!